Are you in search of the best plagiarism checker tools to check whether the content you wrote is unique or not? 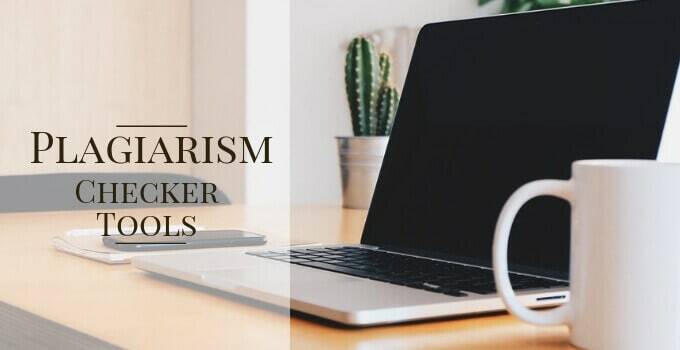 Well, in this article I have listed down eleven top of the class plagiarism checker software which will make sure that your content gets noticed both my search engines and your readers every single time. Also, Check these best grammarly alternatives. Stay tuned till the end to find out the right tool according to your needs. The article covers each and every detail of individuals tools with their advantages and disadvantages. Let’s begin! Grammarly is one of the best freemium automated proofreading tools out there. But did you know, Grammarly isn’t just restricted to proofreading and also offers a fantastic plagiarism checker built in the software? Grammarly checks your content in over 16 billion web pages from the database and lets you know if the content you wrote is copied or not in just a fraction of seconds. 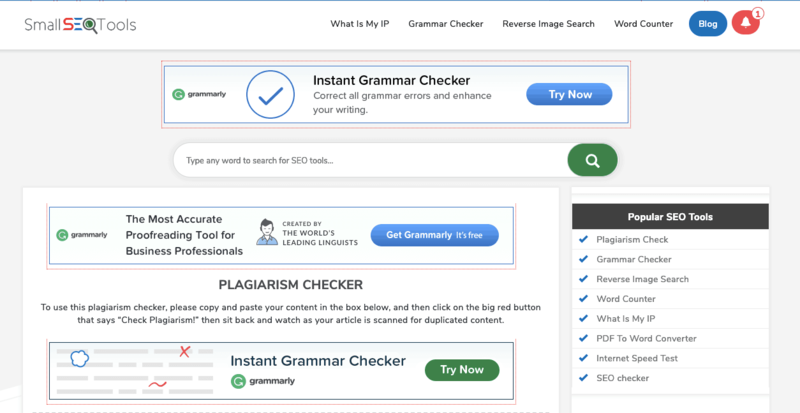 The Grammarly plagiarism checker tool is ideal for bloggers writing blogs, teachers writing grading papers, freelance writers, students writing an essay and for all those who create any type of web content. The plagiarism checker by Grammarly checks and compares your text with other web pages and academic papers stored in their ProQuest’s database. If any part of your text matches with some text which is already published on the web the plagiarism checker will detect it and return it to you as an error. Unfortunately, plagiarism checker in the Grammarly tools only unlocks after you upgrade to the premium plan of the software. But, the real question that you might have in your head is Grammarly worth it? Well, yes because with the premium plan of Grammarly not only you get plagiarism checker but a super powerful proofreading tool that checks over 400+ grammatical errors. If you’d be interested in knowing more about the tool check out our detailed Grammarly review. Moreover, If you want to have a look on the features then you can go for grammarly free trial account. Read | 10 Best Proofreading Tools. Access to 16 billion web page database. Checks over 250+ grammatical errors. Not efficient in the errors suggested by the tool. WhiteSmoke plagiarism checker is almost identical to the Grammarly’s plagiarism checker. Although, Grammarly’s checker is better WhiteSmoke is no less. WhiteSmoke is an all round tool to make your content perfect and optimized both for search engines and your readers. The free version of the tool is enough for most of the newbie bloggers, freelance writers or students. Nonetheless, if you’re a professional author or content creator, I’d recommend you to opt for their paid plan as you get a lot more features and not just a plagiarism checker. You can find out grammatical mistakes from the document. Integrates seamlessly with MS Word and Outlook. Works perfectly while writing academic papers, research papers, email, articles, and essays. WhiteSmoke database has fewer pages compared to Grammarly’s database. Duplichecker is one of the top plagiarism checker tool available to use for free. I personally use Duplichecker to check all my articles and documents. The website is easy to use but they are heavily promoting Grammarly affiliate which makes it look weird. However, if I talk about the site, then Duplichecker isn’t just restricted to plagiarism checker as there are several other free tools which you can use anytime. To name a few, you have Keyword Research Tool, SEO Backlink tool, Image Tool, IP Tool and many more. Coming back, you can paste no more than 1000 words at a time in duplichecker which is a bit painful as you need to copy-paste several times if you want to check five or maybe ten thousand words of article. Once you click on the "Check Plagiarism" button, the tool will start to check for plagiarized content in the article. Wait for sometime and if you get the green text of "No Plagiarism Detected." you're all safe. Nonetheless, if you have any piece of text copied DupliChecker will show you those sentences in red and also show the sources of the text from where it originated. Lastly, if you have a doc with less than 1000 words you also have the option to choose a file and directly upload it, apart from that, they also have a free grammar checker which I personally haven’t tried yet. Read | 14 Best Punctuation Checker Tools. Duplichecker is a completely free plagiarism checker tool. If you register for a free account, you can perform 50 scans in one day. Option to upload your text file directly into the editor. Upload limit of up to 1000 words only. The best is a bit cluttered and you might get lost sometimes. You can only perform one scan without registration. 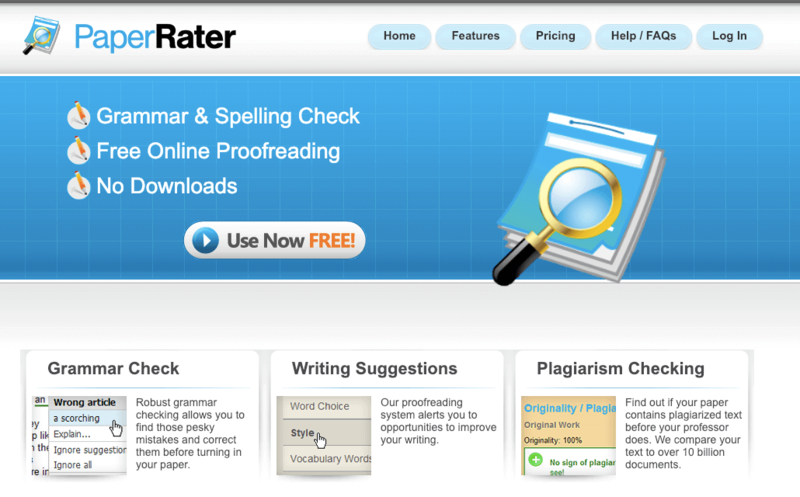 PaperRater is a fantastic online proofreading tool plus it also works as a plagiarism checker. The tool compares your document with billions of other pages published on the web in real-time. Furthermore, it gives you a percentage of the original text found in the document. So, for instance, if you’re article is 70% unique which means 30% of the content written is directly or indirectly copied. To know the copied content PaperRater also cites you the sources from where the content was originally published (only in the paid plan of the software, though!). There’s an option to upload your document and there’s no word count limit on how many words you can check. Phewww. With the free version of the software, you get ten plagiarism to check each month which would be perfect if you rarely create online content or essays. However, if you have a team of writers and have a need to use the plagiarism checker way too often, then the paid plan of the tool comes with the 25 plagiarism checks each month. Once you upload or copy-paste your article in the editor and finally click on "Get report" the checker will instantly start to check the text. I quickly ran a plagiarism check and got a 100% unique content report. 😀 Lastly, you can print the plagiarism report this helps if you want to send it to your clients or in schools to show it to your teachers. An unlimited number of words available to check in one go. The free version offers ten checks every month. 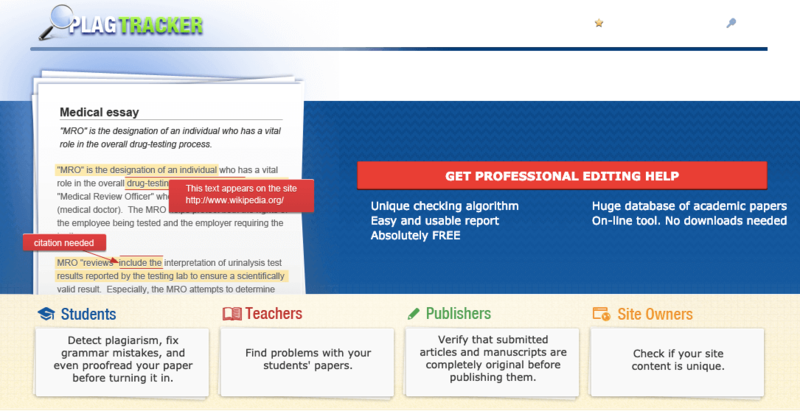 You get free grammar checker and other error checks apart from the mere plagiarism checker. Print functionality to showcase your results to clients or your peers. The paid plan is limited to only 25 plagiarism checks a month. File upload available in .doc, .rtf, .txt, .docx only in the paid plan. No ads shown (only available in the paid plan). You cannot see the actual lines of the plagiarized content in the free version of the tool. 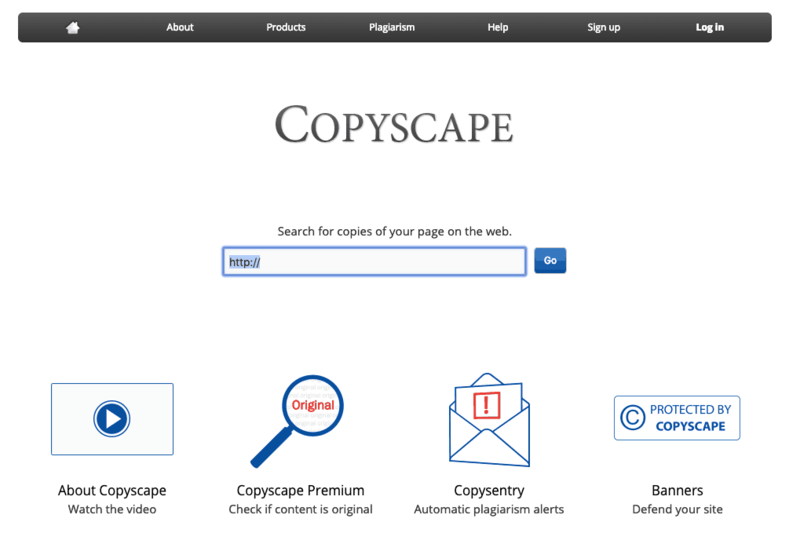 When it comes to premium plagiarism checker tools you’ll always see Copyscape standing at the top. The tool is recommended by BBC, NBC News, Forbes, BusinessWeek and lots of other worldwide popular magazines. Copyscape has a different set of features altogether. In all the other tools you either need to copy-paste or upload the document. However, with Copyscape, you can enter the URL of an already published article and instead of showing you the plagiarized content the tool will show you who all have copied your content. The free version of the tool gives you access to 10 results unlike the paid one which of course a lot more to offer compared to the free version. Apart from that, with the premium version of the software, it goes one step ahead by checking all the offline documents making sure nothing is kept untouched. 1. Content buyers: Those who buy content from Freelancers can check whether the article provided by them is 100% unique or not. 2. Site owners: They buy the software to cross check if someone is misusing the content without giving them the credits. Powerful WordPress plugin which uses Copyscape API to detect any duplicate content on your website. Easy to use and is convenient. Super fast and accurate in detecting the copied content. You need to pay on the number of words want need to check. Quetext is a very well-known online plagiarism checking software. The tool is used and trusted by over 2 million students and teachers. Quetext offers both free and paid plans of the software. If you don’t produce a lot of content online, then the free version of the tool is more than sufficient for you. On the contrary, if you create a lot of content then going with their paid plan would be a clever choice. Let me tell you why. So, with the paid plan of Quetext, you get basic + deep search whereas in the free version there’s no support for deep search. Apart from that, in the free version, you’re restricted with the number of searches and reports you can create whereas with the paid version you can do unlimited searches and create unlimited reports. The word count limit in the free version is just 500 words but in the paid plan it is 25,000 words. Other features which you don’t get with the free version are file upload, pdf report export, and premium support. All this is available at just $10/mo which is crazy cheap considering the features you get. The tool is beneficial to anyone from students to teachers and writers. Because being a content creator you need to make sure all the content produced by you or your writers is plagiarism free. If you buy the paid plan, the software uses deepsearch to search the entire web for plagiarized content. Your content in any way isn’t stored in Quetext database as they respect their customers privacy. A very limited set of features are available in the free version. The only basic search feature is available with the free plan. 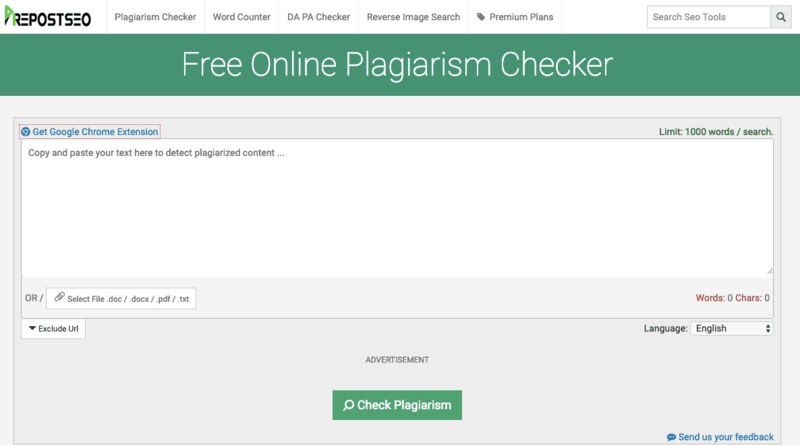 PlagTracker is a cross-platform freemium plagiarism checker holding the sixth place in our extensive list. The tool has a database of over 14 billion web pages on the internet plus 5 billion academic papers with which it compares your article. The tool is a must for students, teachers, site owners, and publishers. Apart from that, it supports plagiarism detection in multiple languages which include English, German, French, Spanish, Italian, Romanian. The tool is currently used by over 30,000 users so you can trust it keeping your eyes close. They do have a paid plan of the software which offers you some additional features like PDF report, access to API, file upload, instant report and much much more. The plan starts at just $7.49 for the first month after which it increases to $15/mo. Is it a lot for a plagiarism checker? Well not really, because once you buy the paid plan you aren’t just restricted to use the plagiarism checker but you have the grammar checker and unlimited checking volume which is entirely missing in the free version of the tool. However, I wouldn’t recommend you to only rely on this tool as the tool in itself isn’t as effective as it should be. Also, at times it shows plagiarism of text even if there’s no plagiarism found in the document which is a mess. Comes with a great set of features if you buy the premium plan. Plagiarism detection in several other languages other than English. Returns some weird and misleading errors. Copyleaks is a great Copyscape alternative and an excellent plagiarism checker tool with which you can check plagiarized content plus also detect if someone is using your copyrighted content. Copyleaks is perfect for schools and universities as they can check up to 100 essays or thesis of students at a time to figure out if anyone has copied the content or not thus saving a lot of time. Surprisingly, Copyleaks also has a plagiarism app for mobile which you can use when you’re away from your laptop but still want to check plagiarized content. Do keep in mind, the free version of the tool restricts you to only check up to 2500 words in a month for free. Also, the paid plan is super expensive compared to the other tools listed here. So, unless you’re a big university or school operating on a huge budget for such tools I wouldn’t recommend you CopyLeaks. Detects plagiarized content in multiple languages. Ideal for schools and universities. The 100 essays or thesis checker feature helps save a lot of time. Restricted to check up to 2500 words in a month with the free version. Before two years when I started writing online web content that’s when I started using Smallseotools. It’s a fantastic and free plagiarism checker software. You can copy-paste or upload a text file of up to 1000 words at a time to check if there’s any plagiarized content or not. However, to be honest, I didn’t find the tool to be highly accurate as at times it showed me plagiarized content even if it wasn’t which is kind of odd. So, if you plan to create online web content for your school assignments or maybe just for a hobby then yes Smallseotools is a great tool to start. However, for anyone who is into writing business as a full-time profession I’d recommend you to go with Grammarly premium as it offers around the clock features with a strong plagiarism checker included. The user interface is simple and easy to understand. You get more free tools right on the website to use like DA PA checker, SEO backlink checker and much more. Filled with a lot of ads. Not highly accurate results produced. PrepostSEO is a similar free plagiarism checker just like SmallSEOTools and Duplichecker. They have a whole bunch for free tools for you to use like the DA PA checker, Article rewriter, reverse image search, SEO score checker, word counter and of course Plagiarism Checker. PrepostSEO plagiarism checker supports multiple languages. Also, you can upload the document or copy-paste it for free up to 1000 words in one check. One beautiful feature which you only get with PrepostSEO is to exclude the URL which means the tool will not compare that URLs text with yours for the plagiarized content. They do have a paid plan which starts at just $10/mo and gives you premium features like deepcrawl, word limit of up to 5000/mo, plagiarism API access, multiple files uploading and 24/7 premium support. But, if you ask me, I’m comfortable using the free version and don’t feel the need to upgrade to their paid plans. I used Grammarly premium to check all the documents that require critical plagiarism checking. The paid plan has support for premium features. Access to other completely free tools. Word count limit of up to 1000 words only. 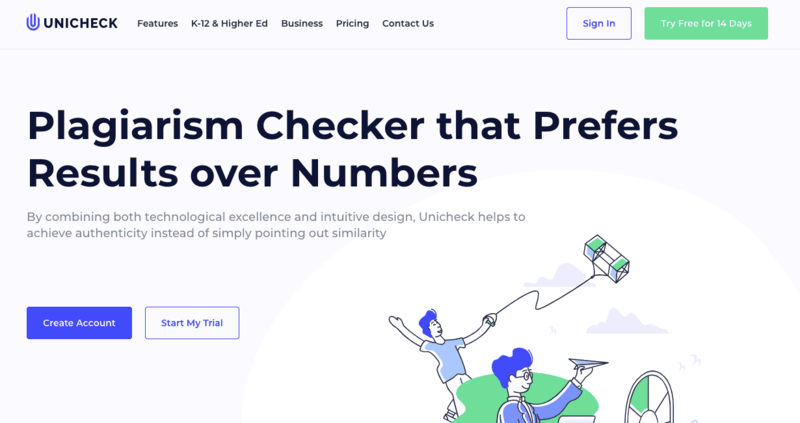 Unicheck is a premium plagiarism checker with all the advanced features which an organization or university would need. 24/5 premium chat and phone call support. Google docs, and G-suite addon. Unfortunately, they don’t have any free plans. However, you can try out the tool by using their 14-day free trial plan. The tool has great features but for individuals, it could be biting the neck expensive. Ideal for universities and organizations operating on a huge budget. Private cloud server and dashboard. If I were to recommend you one tool out of all the eleven mentioned above it would be Grammarly’s plagiarism checker because it is the best in class compared to any other tools from the list. I hope I was able to help you find out the best plagiarism checker tools for your needs. Although I have covered everything in detail for each tool, besides this, if you still have any doubts or queries do leave a comment down below and let me know.